All that talk about the Capitals star players not showing up in Game 1? Fugettaboutit. Nicklas Backstrom capped off a goal-scoring explosion by the Caps in Game 2 Saturday night at the Verizon Center by netting the game-winner just 31 seconds into overtime -- his third goal of the game -- to even up the series as it heads to Montreal. The 6-5 win was quite a test of the Caps' will to win. They found themselves down 2-0 early in the first period, then down 4-1 late in the second period. But the team's top players finally found their way onto the scoresheet. And once they did, there was little the Canadiens could do to stop them. "That was the only way we were going to win this game, by going all offense," coach Bruce Boudreau said. Ovechkin: "Strategy? Just Destroy People"
Alex Ovechkin unveils the key to his success in Game 2. Backstrom had a four-point night, as did Alex Ovechkin. And John "Kid" Carlson showed that his penchant for pressure-situation goals didn't stop in the World Juniors. The Caps roared back from that 4-1 deficit to tie things up late in the third period, only to see the Habs take the lead again with five minutes to go in the game. Carlson sent it to overtime by using a defenseman to screen Jaroslav Halak and firing a wrister past his glove hand with less than two minutes to play in regulation. The play started back in the Capitals zone. Ovechkin picked up the puck and made a move on Mike Cammalleri. After getting beat by the move Cammalleri slashed Ovie's stick in two. With a delayed penalty called, Backstrom picked up the loose puck and cruised through the neutral zone before giving the puck to Carlson at the Habs' blue line. The rookie fired the wrister around Josh Gorges and past Halak to bring on overtime. Backstrom made quick work of the Habs in OT. He picked up the puck in neutral ice and gained the Habs zone, using his speed to back off the Montreal defense. Backstrom did a little curl and drag and, while using defenseman Roman Hamrlik as a screen, fired a wrister past Halak on the glove side. "I feel like we have that sign of our team," Backstrom said. "We never give up. That second period was a little embarrassing for us." There wasn't much rejoicing early on at the Phone Booth, however. After Jose Theodore gave up two goals on Montreal's first two shots, Boudreau made a goaltending change. Theodore was benched for Semyon Varlamov -- quite similar to what happened in the first round of the playoffs last season against the Rangers. In that series, Varlamov started Game 2 after Theodore gave up four goals in Game 1. This time around, Varlamov's entrance at first didn't look like the right move. At one point in the second period the Caps found themselves down 4-1. Andrei Kostitsyn did the damage himself with two goals in the second, giving him a hat trick for the night. The last was a power-play tally -- a Jaroslav Spacek shot from the point that deflected off of Kostitsyn's pants and past Varlamov. The goal created gasps from the sold-out Verizon Center crowd, but Backstrom got the Caps back to within two just 39 seconds later. The slick Swede benefited from a great screen from Mike Knuble in front of the net to put the biscuit in the basket from along the left-wing boards. That goal got the Caps' offense rolling. Ovechkin pushed a rebound through Halak early in the third period to get the Caps to within one, and the Backstrom tied it at 4 by depositing an Ovechkin pass from the right-wing corner into a gaping net. However, the Caps' comeback was anything but complete. Tomas Plekanec, the Habs' hero in Game 1, gave Montreal the lead again by converting a 2-on-1 with Cammalleri with about five minutes left in the game. 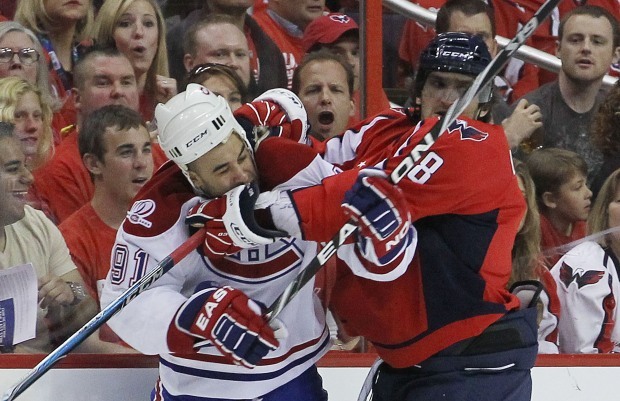 But in the end, the Caps' offense proved to be too much for Montreal to handle. The tidal wave of goals continued, and now the series moves to Montreal with plenty of questions unanswered. Will Theodore get a chance at redemption in Game 3? Boudreau wouldn't play his hand moments after the game ended. "I haven't really thought about who's playing Monday yet," the coach said. Will the Habs be able to handle the Caps' suddenly terrifying offense? And will the Caps continue to build off the momentum of this OT win in Game 2?